Award-winning LDS singer April Meservy was born in Reno, Nevada, but her music career has given her opportunities to perform as far as China for global audiences. She is an indie singer/songwriter who has been featured on over 100 albums and compilations released all over the world. She has shared the stage with artists like Matt Nathanson, David Archuleta, and CAKE, and uses her indie voice and style to uplift and inspire. She recorded the song in her recording engineer’s small home studio after a serious relationship that she was in had just ended. She said, “That morning, in my friend’s small home studio, it was hard to keep my emotions in check. My heart felt achy and raw. I found myself saying, ‘Its’ just so hard. I don’t want to let him go, but I know I need to. 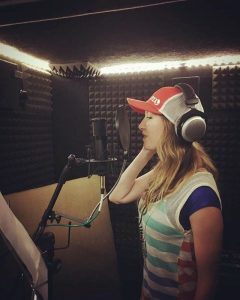 It feels like I can’t live with or without him’. . .. Singing those lyrics hit my soul like someone had ripped my heart wide open to expose my rawest and deepest, fleshiest, most tender feelings.” Aaron, her recording engineer, added his voice to hers, and his is the other voice that is heard on the track. Now, her spontaneous recording is the song the two-time world championship figure skating pair, Meagan Duhamel and Eric Radford, will be ice skating to in the 2018 Pyeongchang Winter Olympic Games this month. This is the first time in Olympic history that figure skaters will be allowed to perform to music with lyrics. The pair have been using April’s song all season in their short program. A surprise Christmas gift from an anonymous giver allowed April to attend the 2018 Canadian National Championships in Vancouver to watch Duhamel and Radford perform to her voice on the ice. Their incredible performance secured their place on Canada’s 2018 Olympic team. I am so proud of my cousin April I Love her voice.